We are starting a brand new year with recently turned four year old Ladybug and 2.5 year old Owl. This year we also have 9 month old Guppy along for the ride. Day 1 is focused on the “Family Tree.” Some new manipulatives, family stamps, were introduced and we had our first experience using Mother Goose Time’s new STEAM (Science, Technology, Engineering, Art, and Math) stations. We also tried out the new “Invitation to Create,” a more process art driven activity, as opposed to the more product driven craft sheets from last year. All of these new elements were received well by the kids and I loved them! Preschool is worthless without the kids buy in and enjoyment. Mother Goose Time has recently raised the bar, made some fantastic, positive changes for the year, and my family is already reaping the benefits. Here’s a quick glimpse of our family enjoying Day 1: Family Tree! We use a morning basket approach at breakfast to get all the kids on the same page for the day. It involves a quick prayer, some SQUILT (super, quiet, uninterrupted, listening time) to classical music, and then we begin with updating our Mother Goose Time calendar and weather. Then we talk about the topic poster of the day and have fun with the daily finger play, song, or rhyme. The family tree topic poster gave us a chance to talk about grandparents and siblings 🙂 They are always fascinated to hear about how Grandma is my Momma and how Uncle Mathew is my little brother! Today’s finger play lent itself well to using the included apple graphics for counting down from 5. 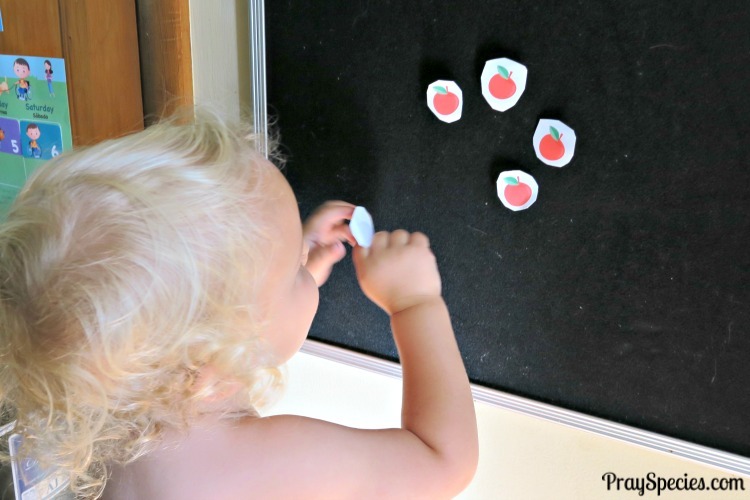 The felt board and some quick application of Velcro dots made the simple game even more entertaining! (Pretend to eat the apples). 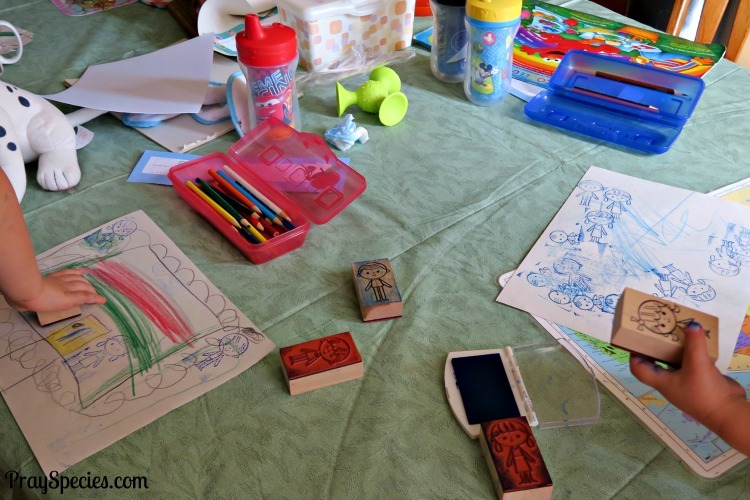 The kids were thrilled with these family themed stamps and stamp pad. We discussed all the people who live in our home. We practiced making stamps and then drew a picture of our home and placed the stamps representing our family members in the different places in the house. Then, we wrote a story about where all the family members were and what they were doing in the home. This was Owl’s first time with stamps. 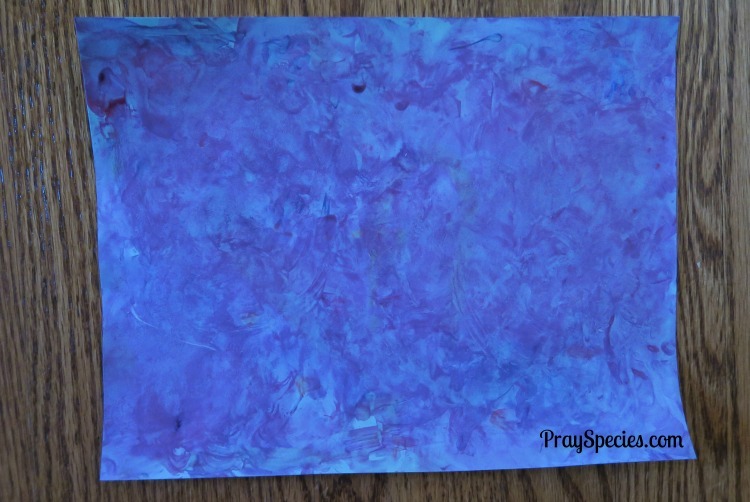 He turned himself blue and used both sides of the stamps. By the end of the exploratory period, he had it all figured out and was making stamps like a pro with only one minor mishap. 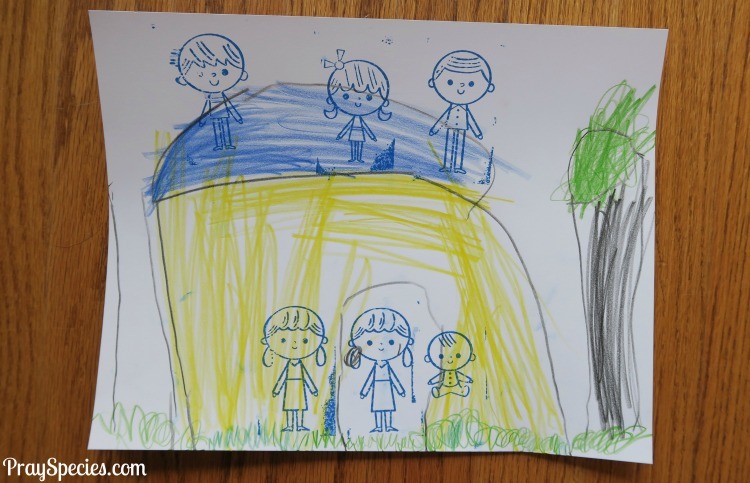 The image below is Owl’s final drawing. I drew the square and then he added the triangle for the roof. He colored the house and added the doorknob. I added some green grass at his request. He placed all the family members in the house, except for Daddy who had to go to work; apparently upside down. LOL Grandma was also outside the house (he applied this stamp backwards) because she had to drive to Ohio. Here is Ladybug’s initial final drawing. I love her tree. Daddy, Ladybug, and Owl are all up on the roof getting some important work done. Grandma is inside with Momma and the baby. She later decided that we needed to add her animals to the house. 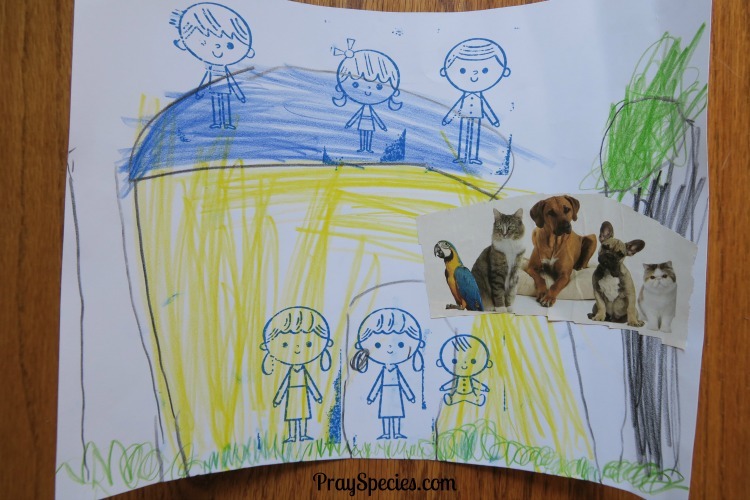 She wanted to include the dog, cat, and birds that are very much a part of our family. Since there weren’t any pet stamps included in this kit, she elected to cut out this image of multiple pets from one of my veterinary medicine magazines and glue it to the page. As always we spent tons of time playing outside and feeling the blessings of hot, summer TN weather. 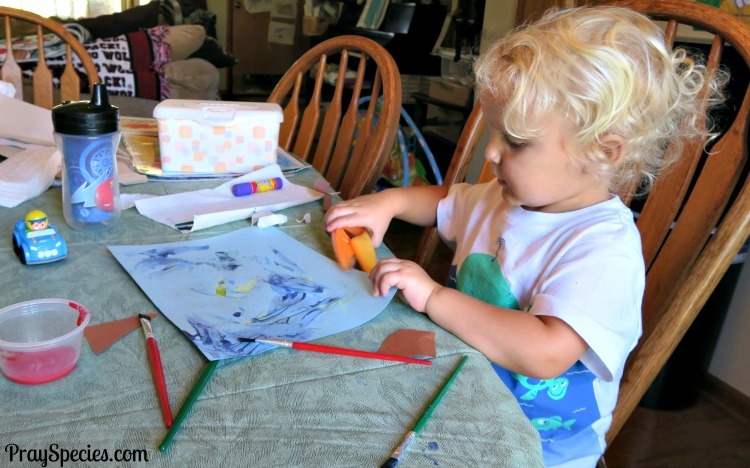 Mother Goose Time has adjusted their crafting activities to be process oriented. The results have been lots of fun for my preschoolers. For this “invitation to create,” the kids were given a beautiful picture of an apple tree for inspiration and then supplied with red and green (I gave them blue and yellow to make green) paint, blue paper, a brown paper strip, glue, markers, scissors, and souffle cups. My daughter decided that her hands made the best leaves and she set about creating “hand leaves” and dots for apples. Owl spent most of his time working with his scissors and making lines for the tree trunk with his paint. Once he realized that Ladybug was using her hands, he was all about panting his hands as well. His creation is shown below. Since there is no pressure to have a final product, I often join in the fun with them. They LOVE when Mom sits down and creates with them! Here is my submission from invitation to create. Their comments were as follows. I love that we are all having fun and enjoying art time. We then spent sometime playing in our pretend kitchen while dinner was prepared. We also read “The Family Book,” by Todd Parr. A simple masking tape letter A on the floor provided great fun. The kids traced the letter with their feet, with an actual apple, and with cars. Of course cars. I am destined to learn a TON about cars, courtesy of my sweet Owl. What did you do today that you want to tell your family? We played our the track entitled “You Gotta Love” from our “Me and My Family” CD and jumped in the air every time we heard the word “Family.” We have an old infant mattress on the floor in our family room that serves as an indoor trampoline for when the kids are having trouble sitting still or need to get out some energy on a super hot, stormy, or cold day. If you’ve enjoyed this post and would like to see more of our Mother Goose Time adventures visit us on Facebook and Instagram! If you are a homeschooling Mom or Dad with a preschooler be sure to say hi! !